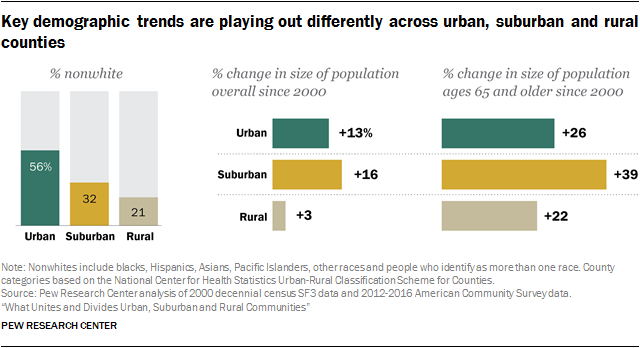 The analysis of how urban, suburban and rural communities are changing along demographic lines (Chapter 1), based on U.S. Census Bureau data, relies on county-level classifications created by the National Center for Health Statistics at the Centers for Disease Control and Prevention. 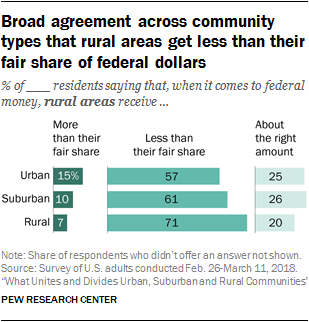 In determining how to draw the lines between “urban,” “suburban” and “rural” communities, Pew Research Center consulted a series of social scientists with expertise in this area. 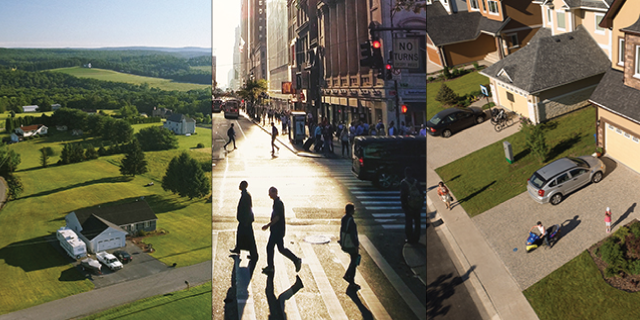 To be sure, there are many ways – and no one right way – to classify communities. 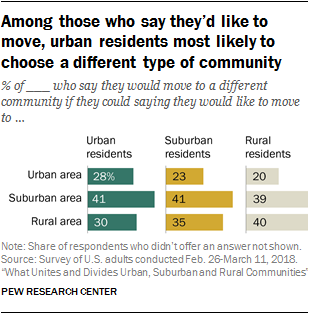 Because the survey explored issues related to how Americans are experiencing life in their local communities, including how they relate to their neighbors and how attached they feel to their communities, we settled on a definition based on people’s description of the area where they live. 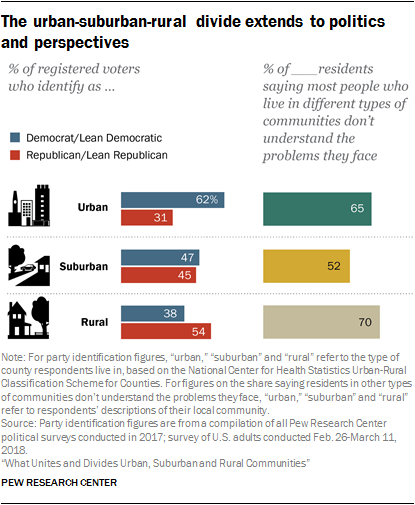 The classification based on counties used in the analysis of census data makes it more challenging to speak to the specific localities where Americans live, but it has the advantage of allowing for the data to be more easily linked among government data sources to analyze changes over time across the country. 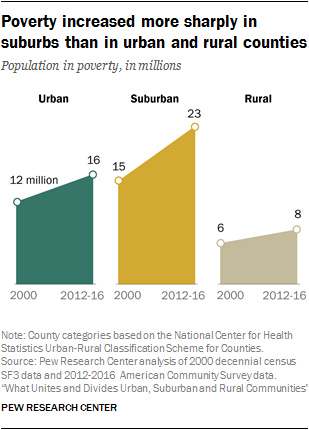 The analysis of how urban, suburban and rural communities are changing along demographic lines (Chapter 1), based on data from the U.S. Census Bureau, relies on county-level classifications created by the National Center for Health Statistics at the Centers for Disease Control and Prevention. 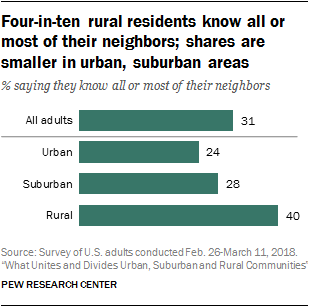 Throughout the report, the terms “urban” and “city” are used interchangeably. 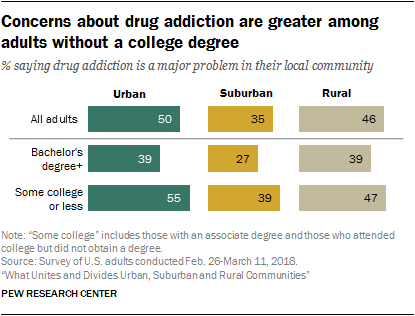 References to Millennials include adults who are ages 22 to 37 in 2018. 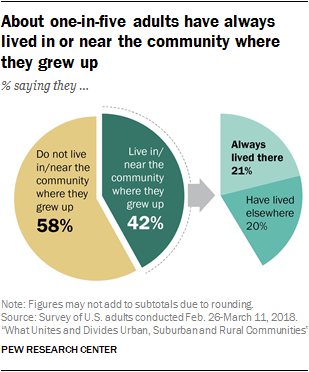 Generation Xers include those who are ages 38 to 53, Baby Boomers include those who are 54 to 72 and members of the Silent Generation include those ages 73 to 90. References to whites, blacks and Asians include only those who are non-Hispanic and identify as only one race. 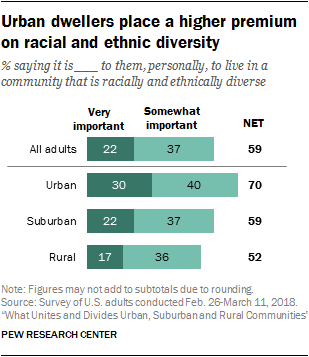 Hispanics are of any race. 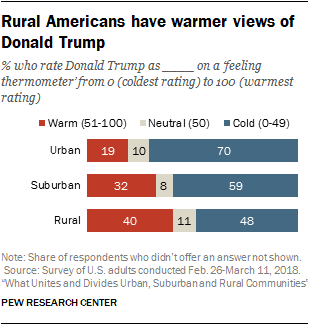 Nonwhites include blacks, Hispanics, other races and people who identify with more than one race. “Upper class” refers to those who said they belong in the upper or upper-middle classes. 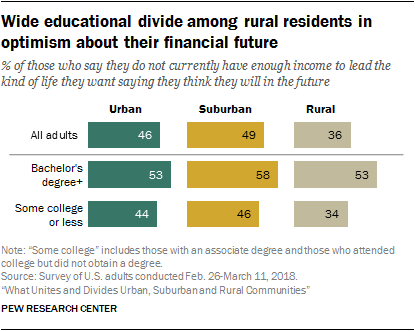 “Lower class” refers to those who said they belong in the lower or lower-middle classes.